Joseph Addai is the running back for the Indianapolis Colts. That means he is in one of the most high-powered offenses in the league. Addai should have plenty of chances to score touchdowns, though Peyton Manning will throw for a significant number of those. The Colts passing game means that Addai won’t have to face eight men in the box very often, so he should have running lanes. Addai is young (3rd year) and should be fresh. Unfortunately, Addai hasn’t ever shown he can take the pounding of 16 games as an every down runner. He split time in college. He split time with Dominic Rhodes in his rookie season. Last year (his 2nd season), Addai broke down at a point. After one disastrous year with the Oakland Raiders, Dominic Rhodes was cut and signed by the Colts. That means that Addai might lose carries to Rhodes this year, though that fact might help keep him on the field for the full year. Adjust expectations for this fact and take Addai as a solid 1st rounder with a lot of upside. Once again, in a league which gives points for receptions, his value goes up somewhat. Joseph Addai was selected by the Indianapolis Colts in the 2006 NFL Draft 30th pick overall. Addai started at Louisiana State University in 2001, but was granted a medical red shirt after only two games. The following season, Addai was a solid replacement until his breakout game against the University of Southern California, where he ran for 98 yards on eleven carries and scored two touchdowns. Addai’s sophomore year was a staple season for LSU, and Addai was one of the major factors in the team�s success leading the Tigers to the BCS National Championship. Joseph Addai’s junior year was more of the same, as he kept producing great numbers while staying relatively healthy gaining the attention of NFL scouts and owners. His value was diminished somewhat by the fact that Addai split carries in college, so there were questions about his durability. This did not stop the Colts from taking a chance on Addai, who combined speed and size unlike many of the other backs in the 2006 NFL Draft. He entered the 2006 NFL Draft and was picked 30th overall by the Indianapolis Colts becoming the 3rd first round running back picked by the Colts since the 1994 NFL draft. Addai�s rookie season in 2006 saw him splitting time with Dominic Rhodes, who was the Colts primary runner through much of the first half of the season. As Joseph Addai became more comfortable in the Colts offense, his role became greater. By the time the playoffs rolled around, Rhodes and Addai were a deadly 1-2 combination. Joseph Addai’s first career start came on January 6th 2007 against the Kansas City Chiefs wildcard playoff game in which he rushed for 122 yards and scored a touchdown on 25 carries with and additional 26 yards from receptions. Last year, Addai�s stellar season fell off at the end, but that probably had something to do with the injuries he picked up (sprained neck and bruised chest). As in the 2006 season, without the injuries he didn�t lose any form going into the final weeks of the season. Joseph Addai is one player I’m avoiding in 2009. I picked Addai in one league as the 5th overall player and cursed him all year long. Joseph Addai came into the NFL with questions about his durability, because Addai had never been the every-down runner in college. After three years in the National Football League, the questions about Joseph Addai are bigger than ever. The Indianapolis Colts front office seems to have rather basic concerns about Joseph Addai’s ability to be a workhorse for their team. At the very least, the Colts are hedging their bets. 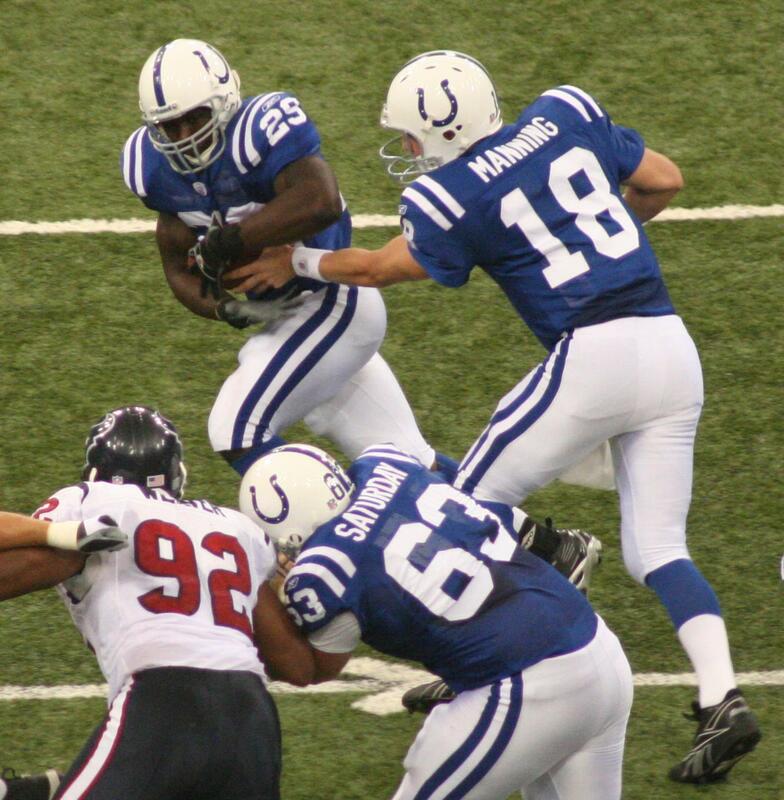 In the 2009 NFL Draft, the Colts drafted a running back late in the 1st round. The Indianapolis Colts drafts Donald Brown, a 5’10", 210 pound running back out of Connecticut. While UConn is known for its basketball more than its football, Donald Brown was a star in college and he impressed scouts at the NFL Combine, finishing among the top RBs in 6 of the 7 categories measured. Donald Brown’s 40-time was Top 5 with a 4.51, though the running times were a little lower than most years. Still, Brown showed breakaway speed and big play ability in college. The only concern is these big plays were not always coming against top competition, so we’ll have to wait and see whether Donald Brown will take a lot of carries away from Joseph Addai. I’m guessing he does. The Colts coaching staff has already indicated that they expect to see Donald Brown make a contribution in 2009. Frankly, I would skip Joseph Addai, draft some other starting running back and grab Donald Brown later as a backup RB, hoping you have the Colts starting runner which Addai inevitably goes out with injury. Joseph Addai enters this season (2008) as the main back for one of the strongest offensive teams in the NFL and if revert back to their starting running back getting 400 plus touches as they did with Edgerrin James, he could finish with some astronomical numbers. In all likelihood, though, Joseph Addai will get closer to 300 carries and somewhere between 40 to 50 receptions which will still see him finishing very high on the charts. Addai excels both running and receiving, and the Colts offensive coordinator, Tom Moore, is sure to find ways to slip Joseph Addai into open space. Though they have one of the toughest running schedules in the league they are a team that produces opportunities, but Peyton Manning should targer Addai plenty out of the backfield, so that shouldn’t matter too much in receptions leagues. Addai is a pretty safe bet for around 1,100 yards 10 to 15 touchdowns and somewhere in the region of 350 receiving yards. On the flip side, Dominic Rhodes is once again a Colt and when Addai and he were paired together in 2006 Addai only got 226 carries so hope that if Joseph Addai is one of your main guys his workload isn�t reverted back to what he had in 2006. So any injuries aside, it will be very hard for Addai to not produce great numbers on this offense and with all those touchdown he is a shoe in for a very top spot in any league.